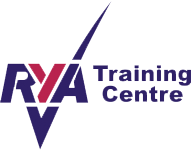 The Club is pleased to advertise details of boats that are for sale. This service complements existing arrangements via the Club notice boards. You are expected to make a donation to the Club in the same way as is customary for advertisements posted on Club premises. How to advertise your boat. 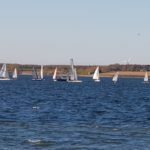 Note that Grafham Water Sailing Club accepts no liability for the following advertisements: responsibility for their accuracy lies entirely with individual advertisers. Carbon spars and boom, all Harken fittings, North sail as new, Carbon tiller and extension, all control lines lead to racks. 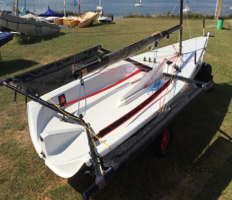 Light grey hull with mid grey boot line, Includes Aluminium launch trolley and top cover. 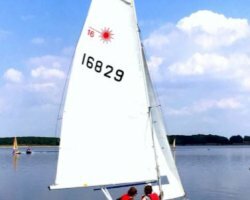 Ideal Family Sailing Dinghy. Literature indicates that it will take ﬁve to six adults, I have had four adults and there was plenty of room. 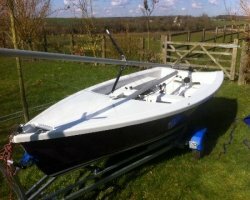 This dinghy has had two owners and has been sailed only in fresh water. This Laser 16 is in very good condition. Spinnaker has seldom been used. Main sail has two reeﬁng positions and Jib has a furler. Approx. 27kg (60lb) alloy centerplate for good stability, ﬁtted on a pulley system. Swim Ladder, Stern Locker & Outboard Fixing Position. Dinghy cover is just over one year old. Launching trolley and road trailer in very good condition. Sold as seen. Sail number 1760. Complete (2016) ready to sail package by Hartley Boats with the new Phil Morrison updated hull configuration. Genoa furling and many extras including launching trolley and matching combi trailer. Current list £11,600. Very lightly used for a few summer months only. Located Cambridge.